There's a nice new two-way bike lane in the median of Pennsylvania Ave. I don't ride in it very often because I'm typically traveling perpendicular to Pennsylvania Ave. 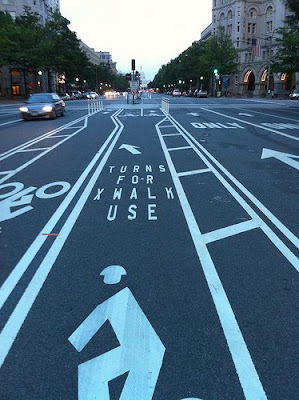 But I did want to note something that has always been a minor annoyance to me, and is more obvious than usual here: Am I the only one whose first instinct is to read that text on the pavement as "TURNS FOR X WALK USE"? I get that you're supposed to read the words in the order you encounter them, but since I can see all of the words at once, my eye is trained to read them top to bottom. I'm sure it's in the MUTCD, because pavement text is always written this way. "AHEAD ZONE SCHOOL," etc. -- it actually takes quite a bit of effort to read it in the order it's intended to be read. There was probably some traffic engineer who considered it a highlight of his career that in 1964, he helped determine the right way to put words on pavement. Well, he was wrong, I tell you! I whole heartedly agree. The first place I encountered this was in Santa Cruz, CA (South Bend doesn't have words painted on the street), where the "Ahead Stop" syntax mystified me for days when I was 12 or so until I figured out whawt was going on. Can we lobby to change this? I also agree. It's these types of observations that usually hang around in my head during the rest of my bike ride, dramatically increasing my chances of being hit by a car or mowing down a pedestrian. Have you also noticed how silly the iconography for the bicyclist looks? I'm pleased that the guys wear helmets, but they're kind of blocky looking. I imagine if those were from '64, they'd actually look better. I'm glad we're on the same page here. Like Dan, I've also felt some self-doubt regarding my inability to read the road text properly. Hannah, if you write the petition, I'll sign. It would make a pretty awesome basis for an advocacy group -- perhaps it could be called "Writing Road Inverted Against Citizens." David, I think the problem with the iconography is that they tried to put a rider on the bicycle at all...most icons that serve similar purposes are much simpler. This one just look goofy. Helmet? I thought that was just a bowl-cut. I agree on the word order. "Ends Lane Bike." Interestingly, road text is ordered the other way (ahem, the *right* way) in England. Where are the international standards?? The London cycle hire scheme launches tomorrow, btw - exciting! Next time you pass through, we'll have to try it out.